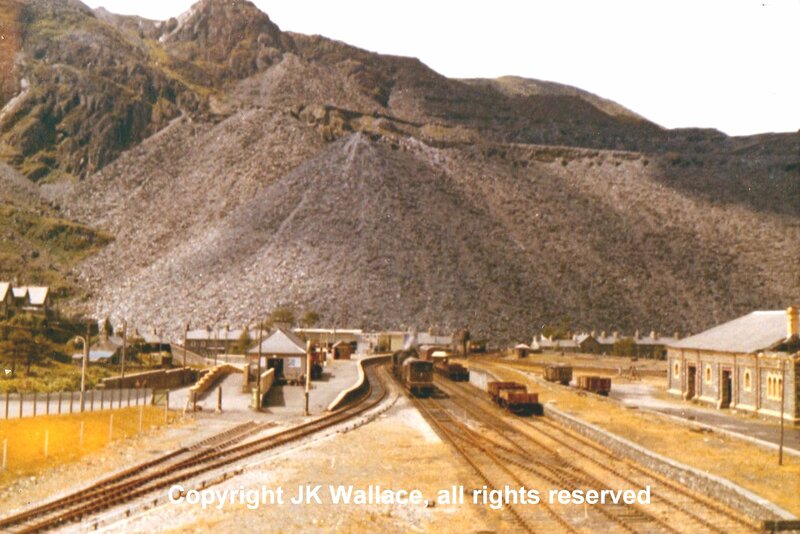 In 2014 the Ffestiniog Railway Society celebrates 60 years of incorporation, and has been inviting members and friends to contribute their stories of their first involvement with the railway. In 1966 my mother chose North Wales for the family summer holiday - this was Sunday 31 July 1966. As there was a memorable occurrence on the day, the event was shared with the FR discussion group some years ago but sadly they were unable to provide an answer. This was the first year my sister didn't holiday with us, and Mother was keen to find a venue that would provide an interest for me. From our guest house window (run by a delightful Mr and Mrs Owen, and now part of the BT car park) one could see the Cambrian Coast line, and of an evening a BR 4MT Standard tank heading southwards with the late afternoon pick-up freight. And we did well. Driving up the Aberglaslyn Pass was an old railway track bed and bridges. It seemed highly unlikely that a railway could ever be restored through the pass but there were embankments, tunnels and rusty girder bridges, as well as a well-built stone bridge on the approaches to Beddgelert that didn't appear to connect to any of the other remains. This wasn't the mystery it might have been to a 13-year old boy as I'd read my neighbours copy of the 'Railway Magazine' which in 1964 had provided an article on the old Welsh Highland Railway. Our first night staying in Portmadoc, we walked down to the Festiniog Railway Station and I had been very impressed with the trident signal out on the Cob. The tracks might be narrow - rather similar to what we knew well in Southport, where the Lakeside Miniature Railway ran for nearly a mile on the 15 inch gauge - but the trident shouted 'main line'. Great news that it will be back in 2014! We went down to Towyn, Aberystwyth and Welshpool and sampled the delights of early railway preservation. My first journey on the FR was on Sunday 31 July 1996 - the day after England had won the World Cup. It was wonderful and primed the pump for a life long interest. 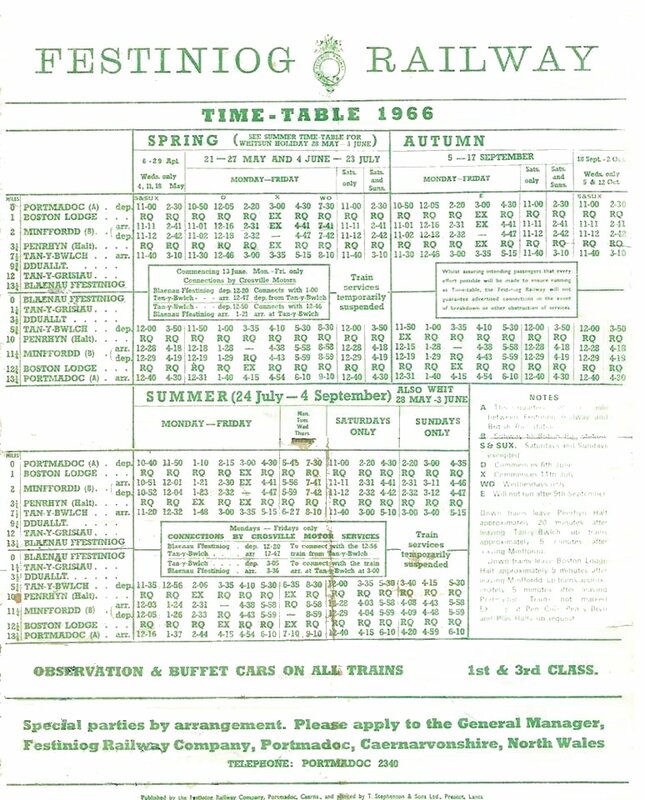 The Festiniog Railway 1966 Timetable showed three Peak-season Sunday trains, all scheduled for the afternoon. This sequence starts with Linda running into TanyBwlch with the morning up train from Porthmadog at around 3:45 pm. Behind the locomotive is one of the Welsh Highlands - either 23 or 26. Everything appears to be normal, and the fireman does not look unduly concerned, looking ahead, with the train staff held in his right hand. 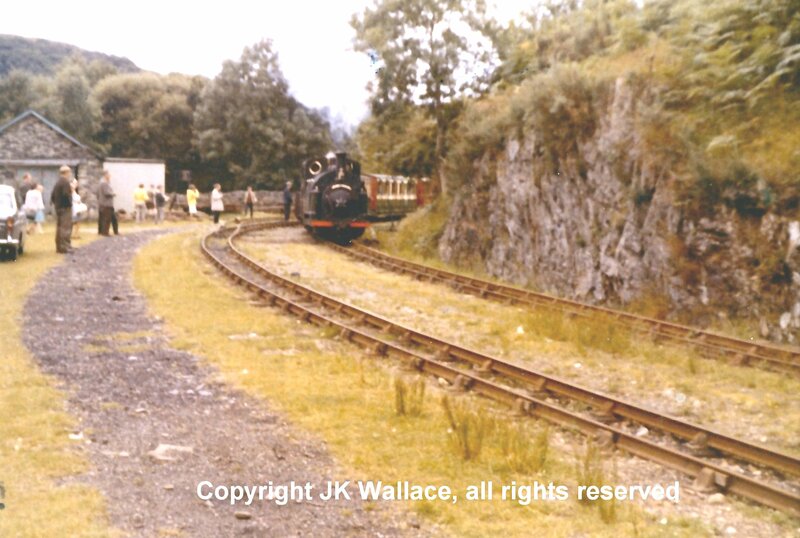 As the loco passes the old station building he will jump off and put the staff in the instrument to allow Prince to follow with the 'B' set of the day. 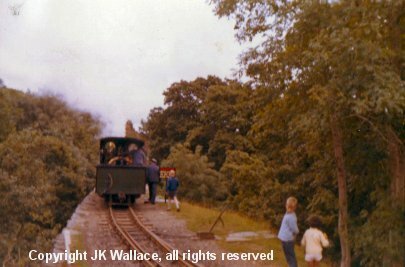 I should add that I do not appear in any of the photographs, as this is my first journey on the railway, and I am in one of the bowsiders, facing the engine on the valley (engine) side. The photographs are all taken by my father, J G A Wallace who was waiting for the train at TanyBwlch. 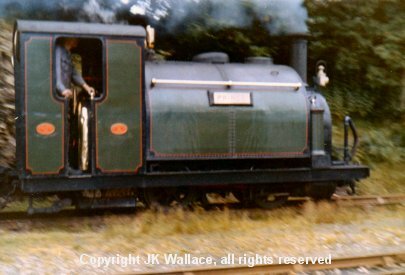 Remarkably he photographed all the staff on the station except for the buffet car crew and in the Bunny (Sales) Hutch, as he also photographed Bessie Jones. 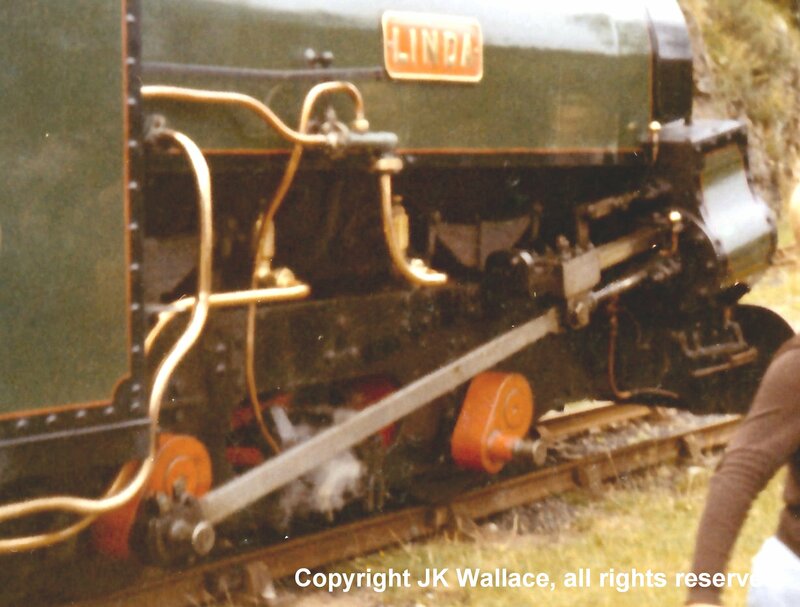 In 1966 Linda ran some 4,824 miles, beating Prince's 4,095, whilst Blanche only managed 2,783. Double Fairlie Merddin Emrys' was technically serviceable for the 1966 season but had been kept in reserve, only coming out for her last week in service with the original wagon top boiler at the end of the summer season. According to the Festiniog Railway Magazine it only ran 206 miles, which equates to just 14 round trips. In July it had a loose eccentric fixed and some tubes replaced followed by a trial run to TYB to prove its fitness as reserve engine. To view larger images, click the photograph. 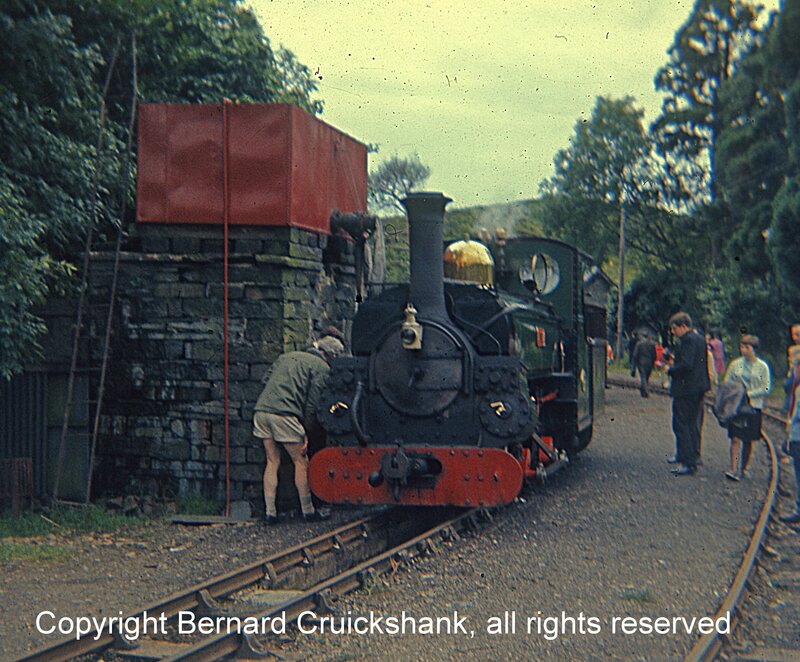 Linda brakes to a standstill at the water tank at TanyBwlch. 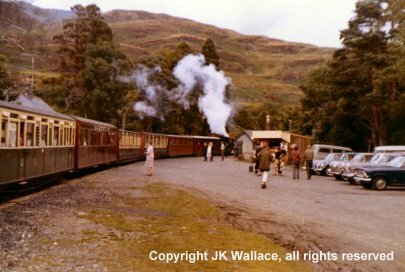 The train consists of the Welsh Highland coaches 23 and 26, two bowsiders, the recently built 24 (to be re-numbered 104), Buffer Car 14 (ex-Lynton & Barnstaple 15/Southern Railway 6993); and (out of site) Observation Car 100. 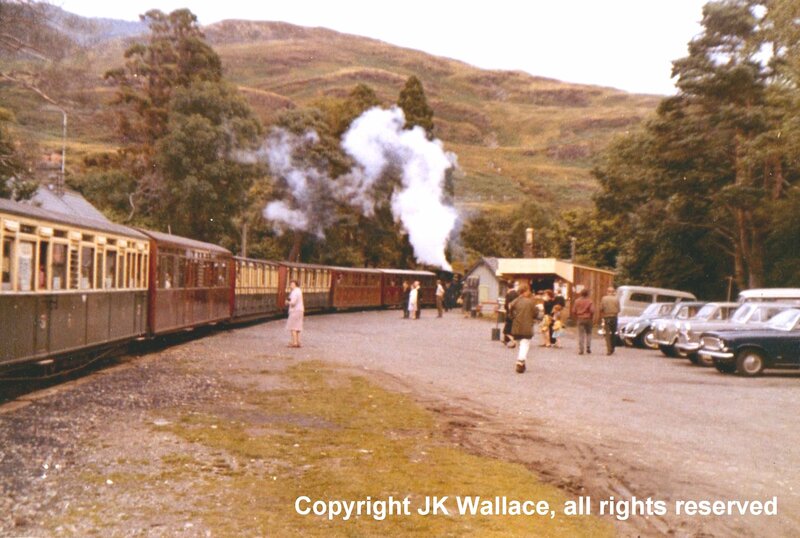 To the left of the parked cars is the sales hut, which was named the 'Bunny Hutch', and when services were extended to Ddaullt, the 'Bunny Hutch' also moved up the line. 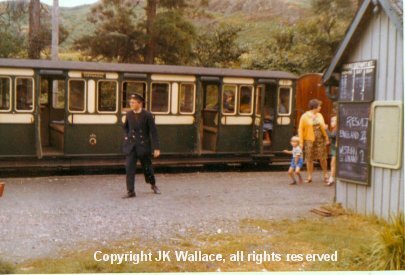 In 1968 it was - after a day in the car park at Porthmadog - where I was assigned for my first week volunteering in 1968. Although the end of a apparently normal run, the locomotive was starting to draw attention, with a number of on-lookers gathered round by the water tank. The number of onlookers continued to grow around the fireman's side of the loco. Normally people don't tend to stand there, as it rather dark and dank, and there's a risk of being dripped on as the fireman tops up the tank... Driver Allan Garraway can be seen standing next to the loco considering his options. 15-year old Martin Cruickshank stands to the left of the photo, wearing a yellow sweater. And now we can see what the passengers were so interested in. 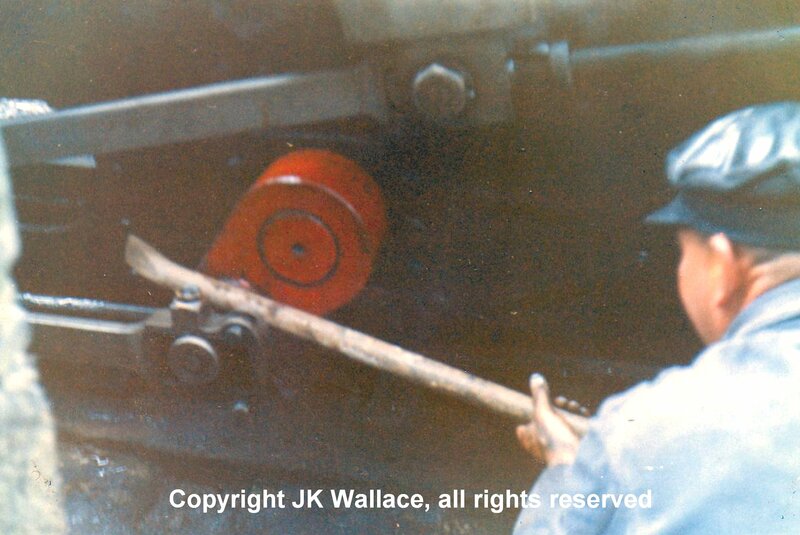 For here is Driver and General Manager Allan Garraway, having removed the brasses, now levering off the coupling rod from the fireman's side of the locomotive. Clearly something is amiss, such that the bearings are presumed unfit for further service, and the locomotive is in danger of being declared a failure. Driver Garraway, having completed his running repairs, edges Linda out onto Creuau Bank. Note that the fireman's side remains a cause of concern, as unusually the driver has adopted a right hand position to drive the locomotive, whilst the fireman is walking alongside the loco having already set the road for the loop. It will be apparent that there was only 40 minutes to remove the coupling rod, and run round the train before Prince arrived with the second train of the day. 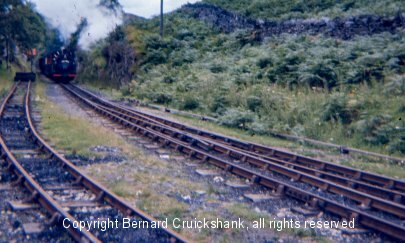 Although built with a right-hand driving position, part of the work carried out at Boston Lodge to suit Linda and Blanche to Festiniog conditions had been the conversion to left hand drive. 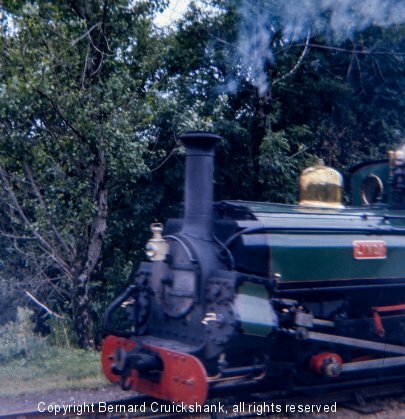 AGWG now gently eases Linda over the top points - having taken great care not to let her slip her by the water tank - and has then rolled down the loop, before again gently approaching the train with 'light' regulator. We have to presume that they arrived at Portmadoc safely, as sadly I left the train at this point, but not before Prince had arrived with the second afternoon working. Guard Alan Heywood is obviously considering his options given the possibility his driver can't make the locomotive go. However on the notice board is a reminder of who won - and by how many goals - the 1966 World Cup. I have checked the FR magazines for mid and late 1966, but there is no reference to this incident. Finally, Prince arrives with the second train of the day, which would have been the 'B' set of the time. Wagon 63 can be glimpsed behind the loco. The train would have consisted of Observation Car 11 (old brake third number 4) and Buffet Car 12 (old brake third number 5). 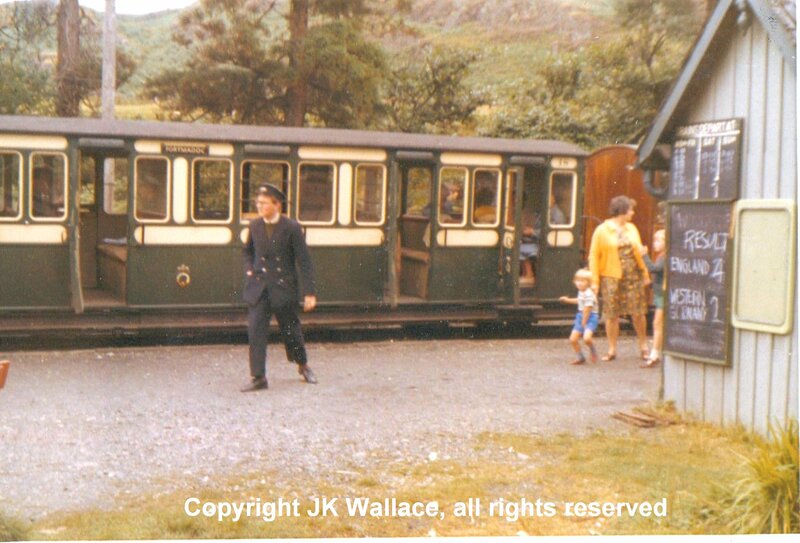 In the 1966 timetable this is shown as arriving at 3-40 pm (15:40 hrs), having left Porthmadog at 3-00 pm (15:00 hrs). Bernard Cruickshank didn't return on the 'Linda' hauled 3-45 pm (15:45 hrs), waiting instead for the Prince hauled departure at 4-15 pm (16:15 hrs). Prince has brought up Hudson bogie No. 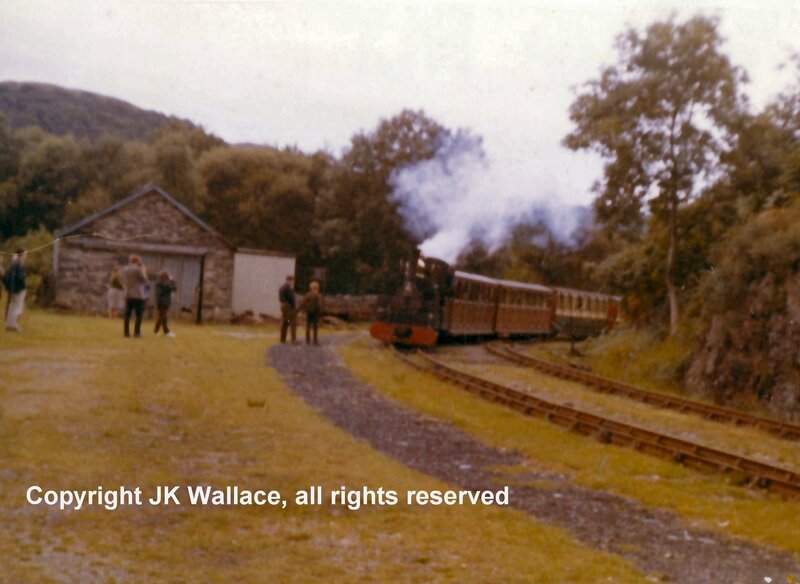 63 (the vacuum-piped vehicle) which was then shunted into the bottom siding at TanyBwlch. This then leaves the small matter of what hauled the 4-35 pm ex-Porthmadog. This was a Sunday departure that had been unadvertised in 1965, but was judged to have been a success, and therefore made a timetabled appearance in the 1966 peak season. I overheard Alan Heywood saying that Blanche would have to be steamed. I had assumed that Blanche was to make an appearance at TyB to rescue Linda and train, but the 'on time' departure at 3-40 pm (15.40 hrs) marked the end of my FfR visit. 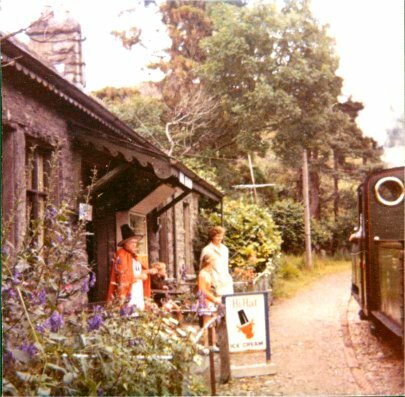 As Prince passed the station house, Station Mistress Bessie Jones stands in the door way to greet the train in her traditional Welsh costume: a trade mark she developed in the 1930s, complete with her own postcards. Note the superb branding of the Hi Hat ice cream that Bessie sold to passengers. I am grateful to Bernard Cruikshnk for permission to publish his photo of Prince subsequently dropping No. 63 into the bottom siding, with Bill Hoole driving. In retrospect, I rather think that Linda would have been taken off the down train at Boston Lodge, with Blanche returning the train to Porthmadog and then working the 4-35 pm. Oddly, the family returned for Easter 1970, and something similar happening again, with Linda requiring careful coaxing from TYB on the downward journey. 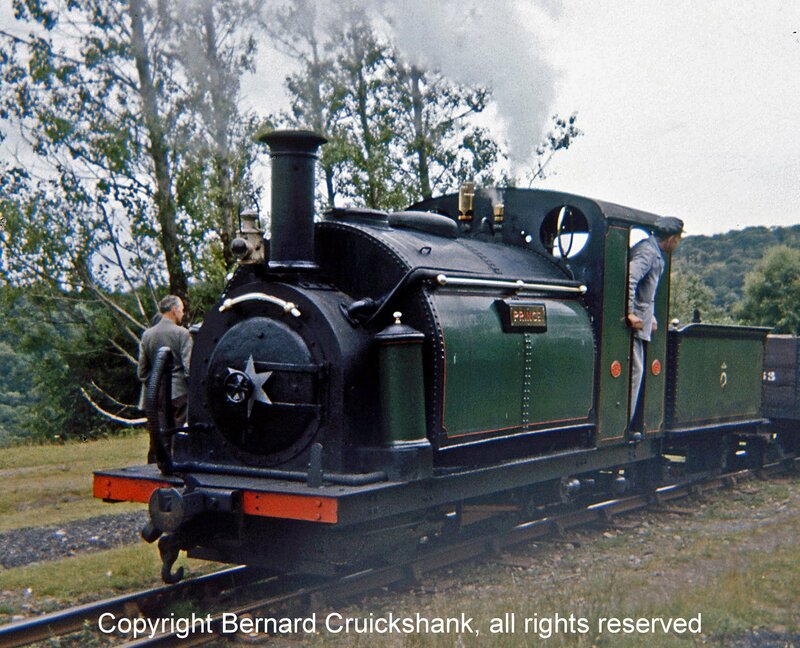 In this instance, Blanche was again steamed, and then piloted Linda and train across the Cob to Porthmadog. 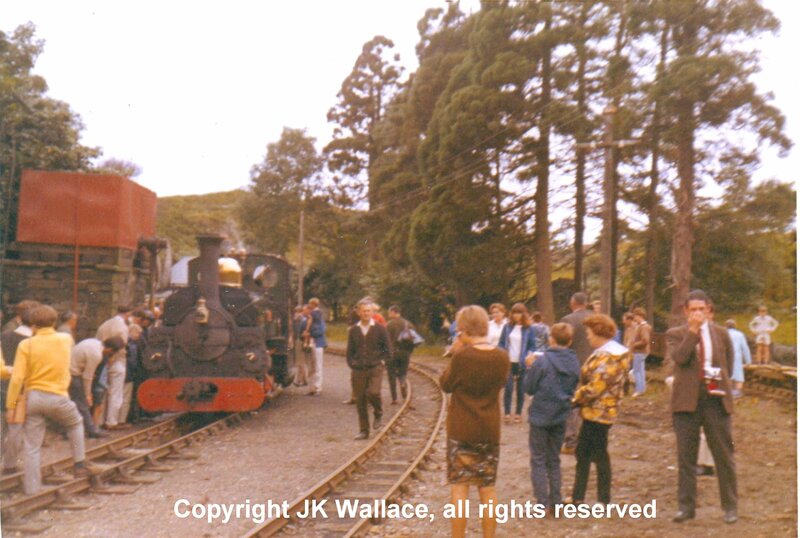 When Bernard returned to Porthmadog, Tasmanian Garrett K1 was standing on display at the end of a siding. This had recently been purchased from the original manufacturer Bayer Peacock when they closed down their operations in Gorton, Manchester.Although a prototype in its own right, being the first Beyer Garret, the Ffestiniog had had a hand in its development. Staff from Beyers were despatched to Porthmadog to see how the flexible steam pipes were arranged on the double Fairlies. These in turn had been developed and perfected by the Works Manager, William Williams. Williams, perhaps rightly, felt that he had put much personal time and effort into this development, and complained to the FRCo that this work had been shared for no acknowledgement or gain. After a spell stored in the open at Boston Lodge and then on display at the National Railway Museum, it was restored for service on the re-born Welsh Highland Railway. At this time construction work on the Deviation had just started, with much of the initial planning well advanced. The return of the Ffestiniog to its original terminus in Blaenau Ffestiniog would be after this station had closed and a new joint station opened on the site of the GWR station behind the photographer. 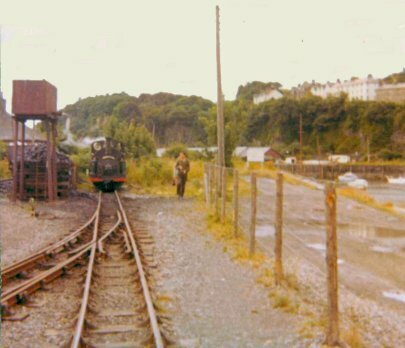 Here a Black 5 simmers gently with the return daily pick-up freight to Llandudno Junction, whilst the departing DMU for Llandudno Junction can be seen in the centre middle distance (to the right of the water tank) with its yellow warning panel. 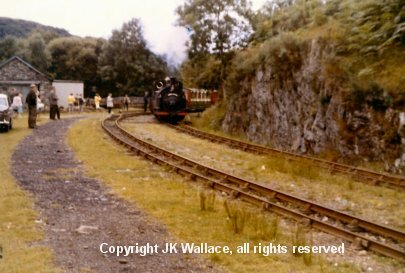 At the other end of the line, Prince is seen in the headshunt at Porthmadog taking water in the last week of July 1966, whilst in the siding stands K1. At the time it seemed highly unlikely that the loco would be rebuilt. 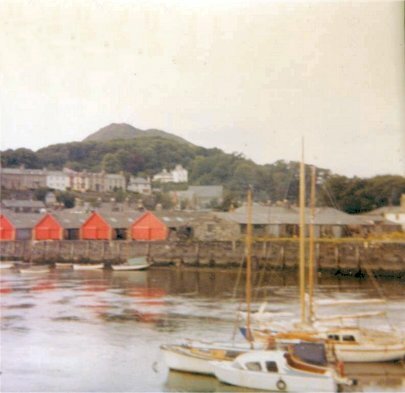 Finally, a view of the slate sheds on the other side of the Harbour complete our 1966 journey. 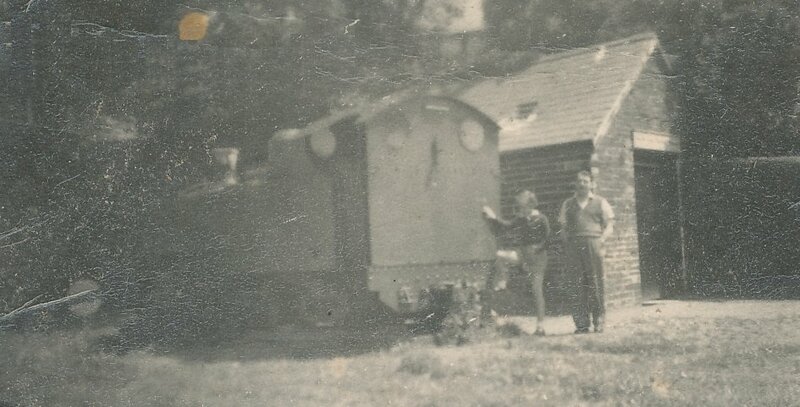 As a tail piece, my parents were instrumental in developing my interest in narrow gauge railways, and here is an early shot taken on a family visit to Towyn. 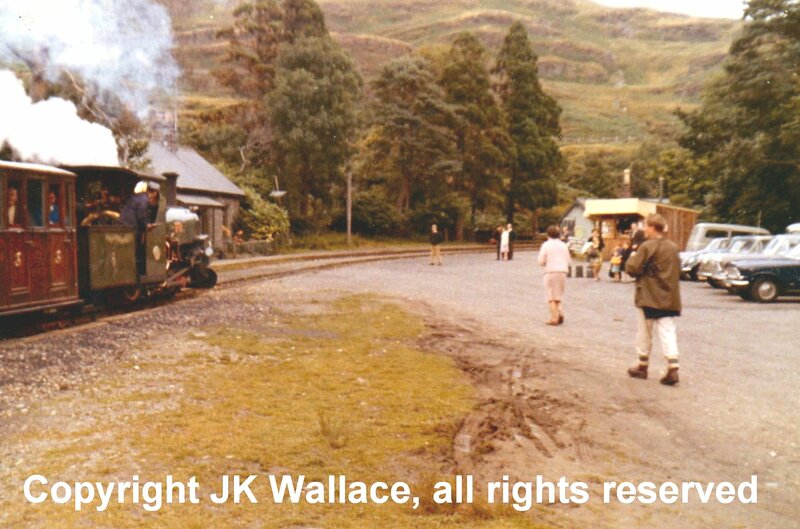 My sister and father have crossed the tracks to stand next to the Welsh Highland Railway's 'Russell'. I don't appear in the photo as I had taken to heart the words of wisdom from my parents that railway tracks were dangerous and must not be crossed for fear of being struck by a train. On this particular day, only one train was running, pulled by No. 4 'Edward Thomas'. In fact, the challenge wasn't so much as to avoid the train, as to find it! We eventually tracked in down at Abergynolwyn, and saw No 4 arrive and run round. The sun shone all day, and my young memories of the day remain very clear. Finally a photo of a couple of models retained from the days when I had a layout based on the Ffestiniog in the 1970s utilising the GEM (George E Mellor) models. These were 5.5 mm scale running on 12 mm track. They made into nice looking models, but failed from poor mechanics as they featured unbushed axle boxes in a whitemetal chassis. Worse, the Mark 2 Fairlie, as shown here, was in effect a 2-4-2, with the motor driving the inner axles (next to the cab) and the leading axles and cylinder blocks being mounted on a pony truck. The cylinder block then levered the powered axles off the track, so its haulage of the accompanying whitemetal coaches was severely limited. Effectively, the model could haul maybe two coaches whereas the prototype could comfortably handle twelve. This model was bought from fellow Festiniog volunteer Merfyn Jones who built the kit in the 1970s. 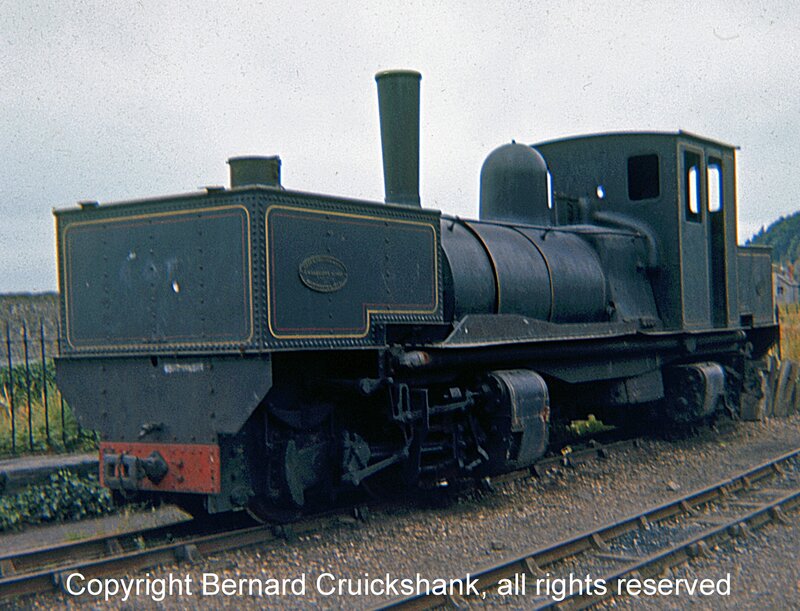 Merfyn had worked for GEM, and this model was painted by the man who made the display models for George Mellor. The coach is a splendid model of car 105 built by Steve Sullivan, and is - as far as I know - Steve's only venture into 5.5mm, as he is still an active 009 man. Steve plus layout featured recently in the 'Railway Modeller'. Steve's 009 model of buffet car 103 appeared in the 'Model Railway Journal' some years ago. Sorry about the track gauge, but I've perched them on the down Copy Pit line on my current OO layout - needs must!